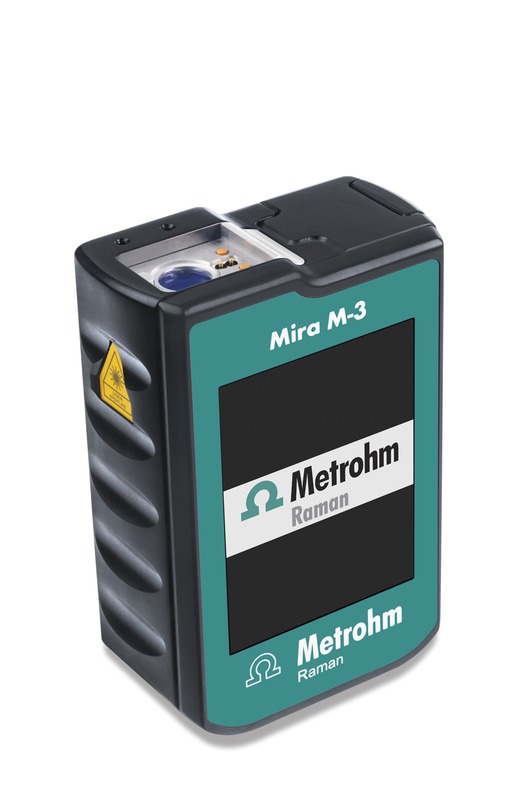 Metrohm USA is proud to announce the release of the Mira M-3 handheld Raman spectrometer. Based on method-driven software, the M-3 changes the landscape of handheld Raman, bringing the controls of a benchtop instrument to a handheld platform. The M-3 allows full adjustment of laser power, integration time, and data processing through customizable operating procedures. Unlike competitive handheld instruments that hide all control of data collection, the user is able to save a method and distribute it to one or more instruments for the highest possible accuracy and reproducibility. New Smart Tip sampling accessories for the Mira M-3 ensure reliable measurements by matching the sampling device to the analysis method. A lockout feature verifies the correct sampling device, ensuring more reliable sampling and improved measurement accuracy. Barely larger than a smartphone, the M-3 enables fatigue-free, truly one-handed operation. From login to final analysis, the large touchscreen guides users through data collection to result display in a matter of seconds. Compliance with the FDA’s 21 CFR Part 11 regulations is seamlessly integrated into the M-3 and MiraCal software, making the M-3 ideally suited for pharmaceutical applications. Multilevel user access controls, audit trails, and secure electronic records exceed regulatory requirements and provide confidence.